Ahhh, memories. Denim skirts take me back to the good ole’ days when I was 13, ate whatever I wanted, and wore scrunchies in my hair. Oh wait, that’s still me today… hehe 😉 But in all seriousness, jean skirts have had a serious comeback this year and I’m all about it. Not only are they really easy to wear, but they’re such a flattering option in place of denim shorts. 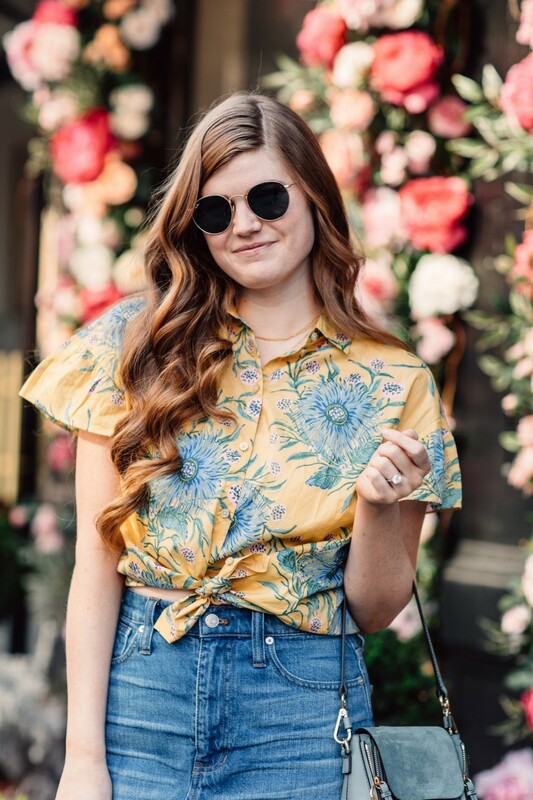 Before I show you some of my current favorite styles, let me just mention that while it does remind me of my middle school days, these are NOT your old Hollister denim mini skirt – the hemlines are longer and the waists are higher (thank god). I like to think of them as the sophisticated older cousins to your 2005 minis. Warning: not to be worn with double polos. This Madewell version is the one I styled in these photos. I love the high waist and the medium blue wash. The raw hem is the perfect finishing touch. This skirt is perfect for brunch, shopping, beach days, etc. I found it runs a bit small – I sized up one size. This Topshop skirt is on my wish list. The midi length, that slit, the wash… It’s all SO good! Love the idea of a white version for summer. The buttons down the front of this Madewell one make it feel really special. The distressing on this one is just enough. And I love the step hem detailing too! A black version is perfect for a night out! I’ve heard great things about this brand but haven’t tried it myself. What do you guys think? Which is your favorite denim mini skirt? Let me know in a comment below! 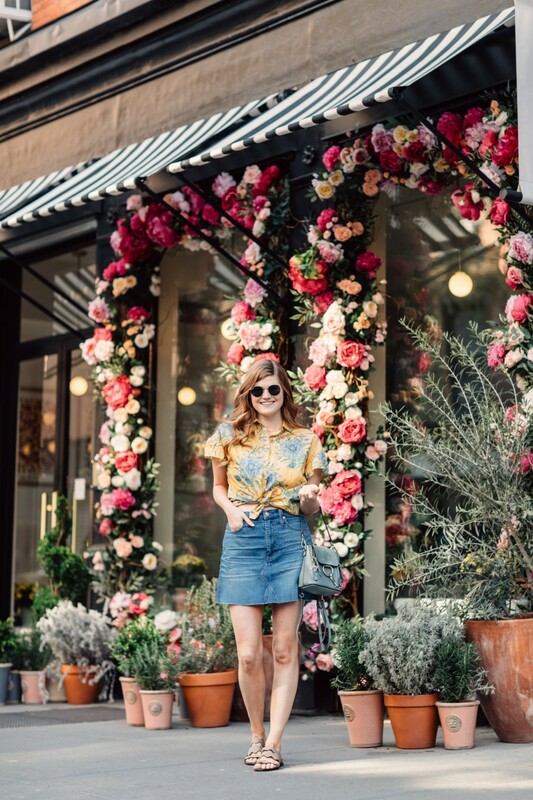 Loving this denim mini skirt? Click here now for more Spring/Summer favorites! I couldn’t agree with this post more. 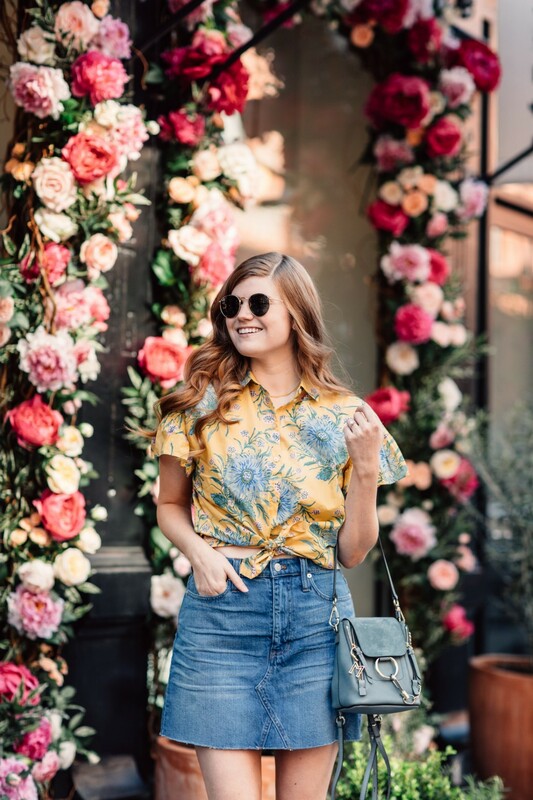 I am denim skirt obsessed! Love denim skirts! Your outfit is really cute, I love your handbag! LOVE my denim skirt! This one is super cute! Um okay those flowers are stunNing and that skirt is adoraBle! 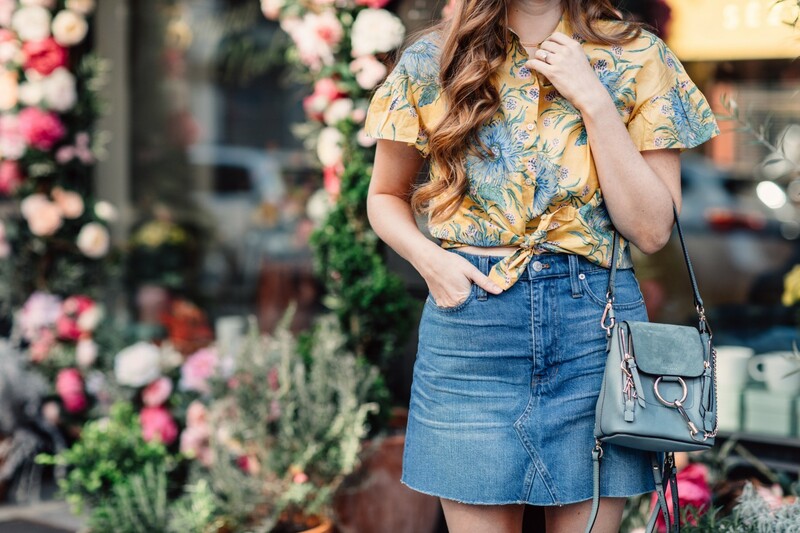 Love a denim skirt for summer! 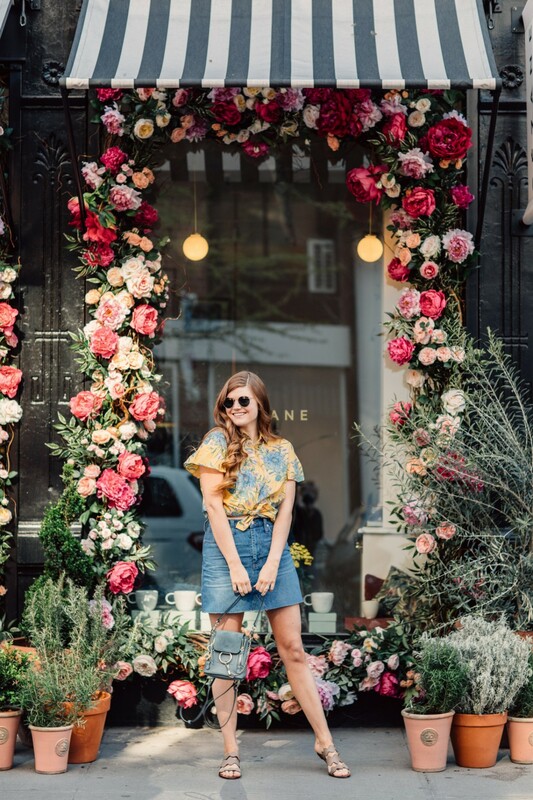 I’ve been loving the denim skirts! 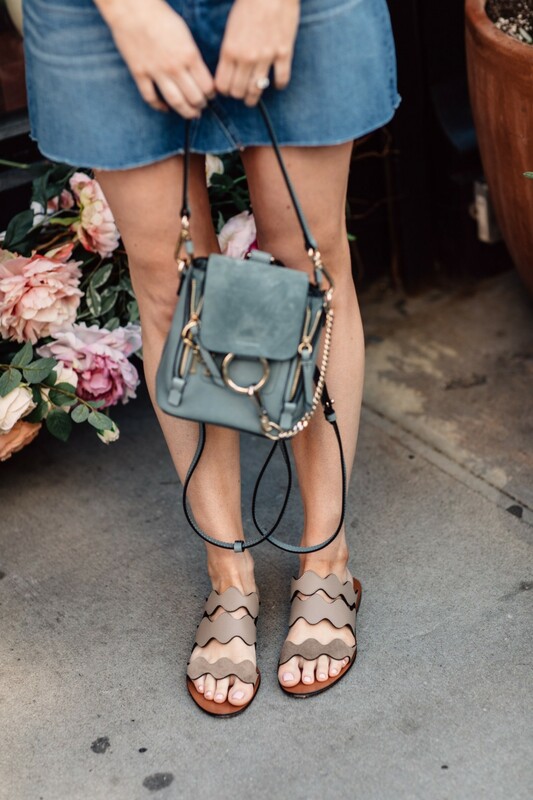 Those sandals are super cute. 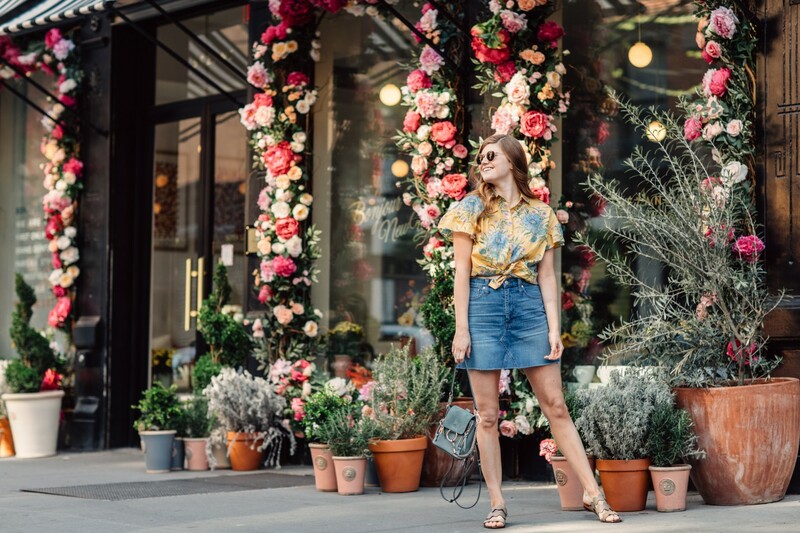 All about a good denim skirt! Also, crushing hard on your slides. They are so cute! You have convinced me. I need one now. Love the look. This outfit is so dang cute! I absolutely love the skirt. I’ve had such a hard time finding one that fits my waist the way it should – but maybe I just need to try this one out! Girl, that denim skirt is killer. So cute! OH MY WORD those flowers! ANd you! This is so adorable. I love the setting and you look so darling in that denim skirt. Thank you so much for your sweet words! I’m so happy to have you here. I hope you enjoyed reading up on old content, and that you are liking my recent posts as well! Loved your blog! Now, I will DEFINITELY wear the floor length denim skirt which I bought sometimes ago. This denim mini skirt is just amazing. I would love to wear it.